When Google first revealed the Chrome OS launcher for Windows in February, it was a blatant attempt to blur the line between operating systems. It turns out, however, that Google had a far more brilliant idea up its sleeve: Chrome OS for Windows 8. Yes, the full-fledged version of Chrome OS is apparently on its way to Windows 8's modern UI. Chrome's non-stable 'dev channel' build currently includes the complete Chrome OS desktop when you open the app in Google’s “Windows 8 mode.” And when I say complete, I mean complete. In Windows 8 mode, Chrome includes the desktop-like interface we first saw in early 2012, an app launcher, and even a little clock in the lower right corner. Before I get the hopes of Google fans too high, let’s be clear that we don’t know if this is just an experiment or a serious effort to bring Chrome OS to Windows 8. Given the massive install of Windows 8 compared to Google’s OS, using the modern UI to deliver Chrome OS is pure genius—and embarrassingly obvious in hindsight. It looks like Windows 8 devices will soon have all the benefits of running two “operating systems” on one device—only without the pain of dual booting or virtualization. While Google has made inroads with Chrome OS, many people still resist Google’s 'browser in a box' since you can buy a full-fledged Windows laptop for about the same as a Chromebook. Giving Chrome OS away for free as a modern UI feature, however, may encourage more people to play around with the platform—and even find a genuinely productive use for the modern UI. 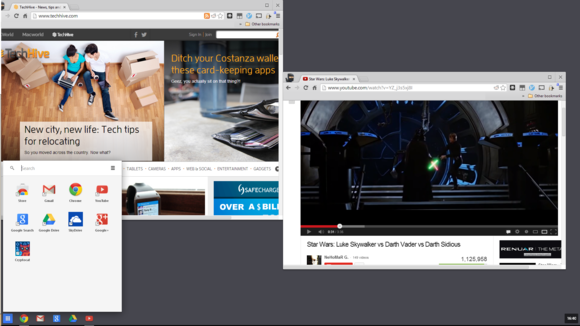 If you’d like to give Chrome OS for Windows 8 a try, just download and install the dev channel build of Chrome. The installer will dump your current Chrome install without wiping out your bookmarks, login statuses, or Chrome extensions. Once you’ve installed the dev build, you can’t launch Windows 8 mode from the menu icon in the top right corner as you do in the stable version of Chrome. Instead, click on the Chrome tile from the Windows 8 Start screen. Don't forget to make Chrome the default Windows 8 browser or the operating system won't let you launch the modern UI app. 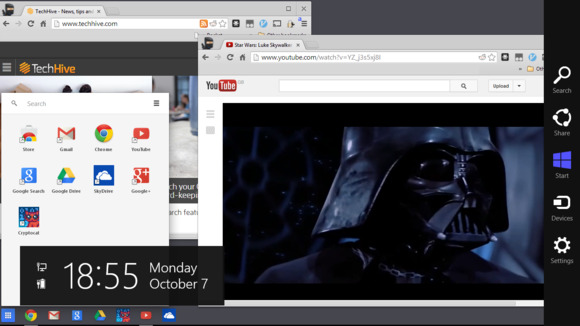 Anyone who has played around with Chrome OS will be immediately familiar with the interface. In the bottom left you see the app launcher on the Chrome OS shelf, next to movable launcher icons for popular services like Gmail, Google Search, Drive, and YouTube. You can even drag your own Chrome apps from the launcher onto the shelf and rearrange them as you see fit. In my tests, the non-Google Chrome app icons didn’t fit on the shelf as neatly as the company’s did. That is a minor visual problem, however, that can be fixed by the time Chrome OS for Windows 8 hits the stable channel—assuming that’s the plan. While the dev channel build works well enough in Windows 8 mode, this version of Chrome OS does have a few quirks. Clicking on the clock on the right, for example, shows you the basic Chrome OS menu with the date, help, and power buttons. This functionality doesn’t currently work in Windows 8, however. Clicking on the power button, for example, doesn’t shut down Chrome or kick you back to the Windows 8 desktop. Another strange thing with this build is that it allows you to run the modern UI version and the traditional desktop version simultaneously. That’s helpful if you have multiple monitors and reasons to view some sites on the desktop and some in the Metro version, but it seems likely this is just a bug clothed as a feature. In my tests, Chrome would sometimes open new tabs on the desktop instead of the modern UI version. This usually happened when I tried opening a new app from the shelf; while clicking on links inside a specific Chrome window, they opened in a new tab just fine. Despite a few very mild rough edges, my brief experience with Chrome OS for Windows 8 was pretty good. If Google continues development and it rolls out this feature to the stable version of Chrome, I could definitely see myself spending more time inside the modern UI version of Chrome. Firing up Chrome from my laptop’s Start Screen is much easier than firing up the desktop for those times I need to quickly take a look at Facebook, send an email, or catch up on the news. On a Windows 8 tablet, Chrome OS could make even more sense and would take advantage of Windows’ touch capabilities as opposed to the awkward touch integration we saw in the Chromebook Pixel. Even better: Assuming Google’s Chrome OS invasion continues, it looks like Windows 8 devices will soon have all the benefits of running two “operating systems” on one device—only without the pain of dual booting or virtualization.